Diffusion is a physical process that refers to the net movement of molecules from a region of high concentration to one of lower concentration. The material that diffuses could be a solid, liquid or gas. Similarly, the medium in which diffusion occurs could also be in one of the three physical states. One of the main characteristics of diffusion is the movement of molecules along the concentration gradient. While this could be facilitated by other molecules, it does not directly involve high-energy molecules such as adenosine triphosphate (ATP) or guanosine triphosphate (GTP). The rate of diffusion depends on the nature of interaction between the medium and material. For instance, a gas diffuses very quickly in another gas. An example of this is the way the noxious smell of ammonia gas spreads in air. Similarly, if a canister of liquid nitrogen leaks a little, nitrogen gas that escapes would quickly diffuse into the atmosphere. The same gas would diffuse slightly more slowly in a liquid such as water and slowest in a solid. Similarly, two miscible liquids will also diffuse into each other to form a uniform solution. For instance, when water is mixed with glycerol, over time the two liquids diffuse radially into each other. This can even be observed visually by the addition of different colored dyes to each of the liquids. However, the same phenomenon is not seen when immiscible liquids like petrol and water are mixed together. Diffusion happens slowly and only across the small surface of interaction between the two fluids. Diffusion is an important part of many biological and chemical processes. In biological systems, diffusion occurs at every moment, across membranes in every cell as well as through the body. For example, oxygen is at a higher concentration inside arteries and arterioles, when compared with the oxygen levels in actively respiring cells. By the time blood flows into capillaries in the muscle or liver, for instance, there is only a single layer of cells separating this oxygen from hepatocytes or skeletal muscle fibers. Through a process of passive diffusion, without the active involvement of any other molecule oxygen passes through the capillary membrane and enters cells. Cells utilize oxygen in the mitochondria for aerobic respiration, which generates carbon dioxide gas as a byproduct. Once again, as the concentration of this gas increases within the cell, it diffuses outwards towards capillaries where the force of flowing blood removes the excess gas from the tissue region. This way, the capillaries remain at a low carbon dioxide concentration, allowing the constant movement of the molecule away from cells. This example also shows that the diffusion of any one material is independent of the diffusion of any other substances. When oxygen is moving towards tissues from capillaries, carbon dioxide is entering the bloodstream. In chemical processes, diffusion is often the central principle driving many reactions. As a simple example, a few crystals of sugar in a glass of water will slowly dissolve over time. This occurs because there is a net movement of sugar molecules into the water medium. Even in large industrial reactions, when two liquids are mixed together, diffusion brings the reactants together and allows the reaction to proceed smoothly. For instance, one of the ways in which polyester is synthesized is by mixing the appropriate organic acid and alcohol in their liquid form. The reaction proceeds as the two reactants diffuse towards each other and undergo a chemical reaction to form esters. Diffusion is affected by temperature, area of interaction, steepness of the concentration gradient and particle size. Each of these factors, independently and collectively can alter the rate and extent of diffusion. In any system, molecules are moving with a certain amount of kinetic energy. This is usually not directed in any particular manner, and can appear random. When these molecules collide with one another, there is a change in the direction of movement as well as changes to momentum and velocity. For example, if a block of dry ice (carbon dioxide in solid form) is placed inside a box, carbon dioxide molecules in the center of the block mostly collide with each other and get retained within the solid mass. However, for molecules in the periphery, rapidly moving molecules in the air also influence their movement, allowing them to diffuse into the air. This creates a concentration gradient, with concentration of carbon dioxide gradually decreasing with distance from the lump of dry ice. With increase in temperature, the kinetic energy of all particles in the system increases. This increases the rate at which solute and solvent molecules move, and increases collisions. This means that the dry ice (or even regular ice) will evaporate faster on a warmer day, simply because each molecule is moving with greater energy and is more likely to quickly escape the confines of a solid state. To extend the example given above, if the block of dry ice is broken into multiple pieces, the area that interacts with the atmosphere immediately increases. The number of molecules that only collide with other carbon dioxide particles within dry ice decreases. Therefore, the rate of diffusion of the gas into air also increases. This property can be observed even better if the gas has an odor or color. For instance, when iodine is sublimated over a hot stove, purple fumes begin to appear and mix with air. If sublimation is carried out in a narrow crucible, the fumes diffuse slowly out towards the mouth of the container and then rapidly disappear. While they are confined to the smaller surface area within the crucible, the rate of diffusion remains low. This is also seen when two liquid reactants are mixed with one another. Stirring increases the area of interaction between the two chemicals and allows these molecules to diffuse towards each other more quickly. The reaction proceeds towards completion at a faster rate. On a similar note, any solute that is broken into small pieces and stirred into the solvent dissolves rapidly – another indicator of molecules diffusing better when the area of interaction increases. Since diffusion is powered primarily by the probability of molecules moving away from a region of higher saturation, it immediately follows that when the medium (or solvent) has a very low concentration of the solute, the probability of a molecule diffusing away from the central area is higher. For instance, in the example about the diffusion of iodine gas, if the crucible is placed in another closed container and iodine crystals are heated for an extended period of time, the rate at which the purple gas seems to ‘disappear’ at the mouth of the crucible will reduce. This apparent slowing down is due to the fact that, over time, the larger container begins to have enough iodine gas that some of it will be moving ‘backwards’ towards the crucible. Even though this is random non-directed movement, with a large bulk, it can create a scenario where there is no net movement of gas from the container. At any given temperature, the diffusion of a smaller particle will be more rapid than that of a larger-sized molecule. This is related to both the mass of the molecule and its surface area. A heavier molecule with a larger surface area will diffuse slowly, while smaller, lighter particles will diffuse more quickly. For example, while oxygen gas will diffuse slightly more quickly than carbon dioxide, both of them will move more quickly than iodine gas. Diffusion in the human body is necessary for the absorption of digested nutrients, gas exchange, the propagation of nerve impulses, the movement of hormones and other metabolites towards their target organ and for nearly every event in embryonic development. Simple diffusion is merely the movement of molecules along their concentration gradient without the direct involvement of any other molecules. It can involve either the spreading of a material through a medium or the transport of a particle across a membrane. All the examples given above were instances of simple diffusion. The image is a simple representation of the diffusion of one particle in another medium. Simple diffusion is relevant in chemical reactions, in many physical phenomena, and can even influence global weather patterns and geological events. In most biological systems, diffusion occurs across a semi-permeable membrane made of a lipid bilayer. The membrane has pores and openings to allow the passage of specific molecules. 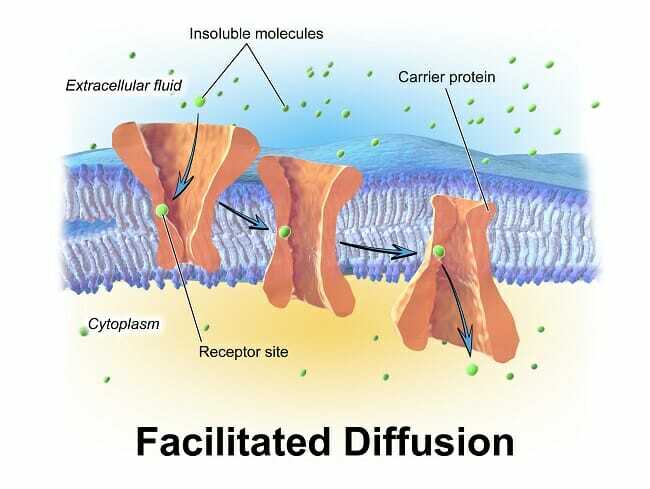 On the other hand, facilitated diffusion, as the term indicates, requires the presence of another molecule (the facilitator) in order for diffusion to occur. Facilitated diffusion is necessary for the movement of large or polar molecules across the hydrophobic lipid bilayer. Facilitated diffusion is necessary for the biochemical processes of every cell since there is communication between various subcellular organelles. As an example, while gases and small molecules like methane or water can diffuse freely across a plasma membrane, larger charged molecules like carbohydrates or nucleic acids need the help of transmembrane proteins forming pores or channels. The image shows the movement of an insoluble molecule from the extracellular space towards the cytoplasm. Since they are relatively large openings in the plasma membrane, these integral membrane proteins also have high specificity. For instance, the channel protein that transports potassium ions has a much higher affinity for that ion than a very similar sodium ion, with nearly the same size and charge. Concentration Gradient – Gradual decrease in the concentration of a substance, often a solute in a solution. Within living systems, this gradient is usually seen on two sides of a semi-permeable lipid membrane. Hepatocytes – Cells in the inner parenchymal region of the liver, making up a large proportion of liver mass. Involved in the digestion and metabolism of proteins, lipids and carbohydrates. They also play a crucial role in the detoxification of the body. Integral Membrane Protein – Proteins that span the width of a membrane and are important structural and functional parts of biological membranes. Sublimation – The conversion of a material in its solid phase directly into the gaseous state, without an intervening transition into the liquid state. 1. Which of these statements about diffusion of molecules is true? C is correct. The movement of one molecule along its concentration gradient is unaffected by the concentration gradients of any other substances in the same medium. 2. If there was a coolant near the mouth of a crucible heating iodine how would that affect its rate of diffusion? C is correct. The presence of a coolant at the mouth of the crucible would lower the temperature of iodine gas. This would reduce the rate of diffusion. 3. Which of these statements is NOT true? A is correct. Polar molecules can diffuse across membranes, but they need the presence of a transmembrane channel or protein. Carbon dioxide is lighter than bromine and therefore would diffuse more quickly. Mehrer, H. and Stolwijk, N. A. (2005). “Heroes and Highlights in the History of Diffusion”. Diffusion Fundamentals 2, 1.1–1.10. Philibert, J. (2009). “One and a Half Century of Diffusion: Fick, Einstein, before and beyond”. Diffusion Fundamentals 11 (1):1-32. Spaeth, E. E., and Friedlander, S.K. (1967). ” The Diffusion of Oxygen, Carbon Dioxide, and Inert Gas in Flowing Blood”. Biophys J. 7(6): 827–851.